30-Jul-2005 -- Since the time I discovered the Degree Confluence Project about two years ago, I have visited ten confluences, all of them located in the U.S., within driving distance of where I live, and all having been successfully visited previously. From time to time, I wondered how I might go about visiting an "open" confluence--one with no successful visits--but initially it seemed unlikely that I could visit one without spending a considerable amount of time and money. In the lower 48 states of the U.S., the few remaining unvisited confluences are located in remote wilderness areas, highly restricted areas such as military bases or nuclear facilities, or far offshore in the ocean or one of the Great Lakes. Last year, I thought I might be traveling to Vietnam on business, with a side trip to Japan, so I identified two confluence possibilities, 22N105E in Vietnam and 35N140E in Japan. Unfortunately, the trip never panned out, and both of those confluences were subsequently conquered last fall. Thus, it seemed that I would have to take a special trip--a "confluence vacation"--in order to reach my goal. Since cost would be a factor, I once again began looking closer to home. Eastern Canada, particularly the Maritime Provinces and Newfoundland, seemed to be the most promising region. Immediately, I focused my attention on one confluence: 45N62W, just offshore in Liscomb Harbour on Nova Scotia's Eastern Shore, was still incomplete, despite being perhaps the most easily accessible open CP remaining in eastern Canada! Dave Heffler had attempted it in September 2001, but he did not try to get to it by boat, so his closest approach was about 500 meters. He stated his intention to try again, but he never got around to it. Considering how easily the point can be reached in a relatively small boat, it's amazing that nearly four years passed without anyone even attempting to visit. Although my plan to visit 45N62W was hatched last fall, I didn't really get serious about it until June. I had never traveled outside the U.S. before, and I was a bit leery about flying in the post-9/11 world. But I also realized that I couldn't wait forever. Summer, the most suitable time of year to visit this confluence, was fast approaching. Someone else could beat me to the confluence; someone might visit it without posting a plan beforehand or even bothering to contact me about my plan (that has happened before, but I won't name names). Finally, my mother sent me a Nova Scotia tourism guide in late May. That was my wake-up call. As I flipped through the pages, I suddenly realized that it was now or never. Within two weeks, I had the trip completely organized. My mother and I flew from Newark to Halifax on July 25 and stayed overnight in Dartmouth, just east of Halifax. The next day, we drove east along Highway 7, known as Marine Drive, about 120 miles to the small community of Liscomb on the Eastern Shore, where we would stay for a week. This is not a journey to be rushed; the road winds its way along the deeply indented coastline most of the way, passing through numerous small villages, with many scenic views and places to stop and take pictures. The predominant native vegetation on the Eastern Shore is mixed boreal forest, with deciduous trees becoming more abundant inland, while near the coast most of the trees are conifers. During our week on the Eastern Shore, we stayed at a guest house, which is part of the Birchill Bed & Breakfast and Guest House, run by Roslyn and Timothy Spears. The B&B is located in Liscomb, while the guest house is about 3.2 km to the west on Highway 7, in another very small community called Spanish Ship Bay. The guest house is in a delightful setting, up on a small hill overlooking the waters of Spanish Ship Bay. It has a couple hundred feet of waterfront with a rocky beach, a dock, and two kayaks for guests to use. 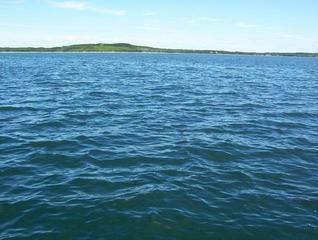 There are marvelous views across the water to a small peninsula and some islands to the south and southwest. Inside, the living room and the master bedroom also have these views, and the second bedroom has a nice view in another direction. Overall, the house is extremely attractive and well kept, and I would enthusiastically recommend it to anyone planning to visit this part of Nova Scotia. When we arrived in Liscomb and met Roslyn and Tim, we discussed plans for visiting the confluence. My first idea was to try to get there in the kayaks, but my mother was concerned about the distance involved (perhaps as much as 8-10 km round trip) and the possibility of rough water. Plus, I had never been in a kayak before. I tried to assure her that the confluence was located in a sheltered bay, surrounded by islands and peninsulas on all sides, and thus well protected from the full power of the open ocean. However, she was not buying it. Fortunately, Tim was enthusiastic about my project and offered to take us out to the confluence in his motorboat. He explained that he had gone there before; he knew from his maps of the area that there was something interesting there, but he hadn't heard of the DCP until I explained it to him. Now, we were all set to bag the confluence; all we needed was favorable weather. For our first couple of days on the Eastern Shore, the weather wasn't very good. It was cool, overcast and foggy, with a stiff wind blowing off the water. Fortunately, the forecast called for improving weather as the week went on. We spent the first three days exploring various places in the eastern part of the province, including Sherbrooke, Antigonish, Cape George and Port Bickerton. Our goal finally achieved, we then went on to approach the lighthouse on Liscomb Island, which I hadn't thought of doing, but Tim suggested that we check it out. Liscomb Island is visible on the right side of picture #3 (looking east); the left side of the picture shows part of Hemloe Island. The lighthouse is located on the southwest shore of Liscomb Island; its exact position is 44°59'15.8"N 61°57'58.4"W. When we visited the Nova Scotia Lighthouse Interpretive Centre in Port Bickerton, I had looked at a set of books that listed the coordinates of every lighthouse in Nova Scotia, but I didn't write down the position of the Liscomb Island lighthouse, figuring I could find it on the Internet later. That proved to be harder than expected. I did find a few sites that gave the positions of lighthouses, but they all listed the coordinates rounded to the nearest minute, which is not precise enough for the calculations I needed to make. After much searching, I finally found a listing of the precise locations (down to the nearest tenth of a second) of Canadian lighthouses on the Notices to Mariners web site operated by the Canadian Coast Guard. Now, knowing the exact coordinates of the lighthouse, I could use spherical trigonometry to determine its distance from the confluence. (To be most accurate, the earth should be treated as an oblate spheroid, rather than a sphere, but for distances as short as the one to be calculated here, it doesn't matter very much.) This distance turns out to be almost exactly 3.0 km, roughly east-southeast of the confluence. I had to take several pictures of the lighthouse because it was hard to keep the camera steady in the rough water. The lighthouse picture shown here was taken using the maximum optical zoom (3x). I'm not really sure how close we got to the shore, but it might have been within 200 meters. Tim wasn't keen on going much closer. When I was satisfied that I had enough good pictures, we headed back to the guest house and I took a few more pictures on the way back. We thanked Tim and offered him compensation, which he somewhat reluctantly accepted. Hopefully, my glowing recommendation of the Birchill B&B here will serve as additional compensation and help boost business in the years to come! After lunch, we decided to explore the large peninsula that lies on the south side of Liscomb Harbour; the confluence is just 500 meters north of a point near the eastern end of the peninsula, and that point is where Dave Heffler made his closest approach almost four years ago. The land that is visible in picture #4 (looking south) is the north shore of this peninsula. The road that runs the length of the peninsula is called West Liscomb Point Road; it joins Highway 7 in West Liscomb, about 3 km southwest of Liscomb Mills. The road is unpaved, but initially it is a decent quality gravel road. However, it soon becomes rougher and narrower, and without an off-road vehicle, it is only marginally passable for most of its length (we drove about 8 km in our rental car, averaging about 20 km/h, before the road became truly impassable). The point where we had to turn back is exactly the same as what Dave Heffler's picture #5 shows. I thought about trying to follow a logging road that may have gone down to the shore, hoping to take a picture in the direction of the confluence from that vantage point, but my mother strongly discouraged me from doing so. We turned back at that point, having gone as far as we could. I was relieved to get the confluence visit taken care of, and delighted that it went so well. Now we could spend the remainder of our vacation going farther afield. The next day brought even more beautiful weather, and we embarked on an ambitious trip to Cape Breton Island. We drove the entire length of the Cabot Trail, the spectacular highway that follows the coast from Margaree Harbour on the west side of the island to St. Anns on the east side, passing through part of Cape Breton Highlands National Park and going as far north as Cape North, nearly at the 47th parallel. This is as far north (46°53'N) as I have ever been in my life. (Someday I will return here and go all the way to Meat Cove, the northernmost settlement in Nova Scotia, and hike to Cape St. Lawrence, at the northern tip of the island, which is just north of 47°N.) South of Neils Harbour, on the eastern part of the Cabot Trail, we reached 60°19.5'W, the furthest east I've ever been. Amazingly, we twice passed within 150 meters of another confluence, 46N61W, which is located quite close to Highway 105 near Bucklaw. I had not made any plans to visit this CP, nor had I even looked at it on the DCP web site, because prior to our trip I didn't even know we would be going to Cape Breton Island. My maps showed the CP to be almost directly on the road, but there is a lake, Denas Pond, on the southeast side of Highway 105. Without actually being there, I couldn't determine whether the CP was on land or in the water. I turned on my GPS in the car, hoping I might be able to make a quick visit to 46N61W, but it was not to be. At the closest approach, the GPS indicated that the CP was indeed in the water, some 150 meters away from the road. In addition, I would have had to climb down a steep embankment through the woods just to reach the shore, and it looked doubtful at best that I could get within 100 meters without going in the water. We also had many hours of driving ahead of us, and attempting this unplanned confluence visit, which was unlikely to be successful anyway, might have cost us valuable time. I was a little disappointed, but at least I had the whole day of driving around Cape Breton Island to look forward to. After driving the entire length of the Cabot Trail, we passed near 46N61W again going the other direction on Highway 105, and by that time dusk was approaching. In all, we were on the road for more than 13 hours today, and I drove 450 miles! On our last day on the Eastern Shore, we drove east on Marine Drive to Canso, on the eastern tip of "mainland" Nova Scotia, and visited Grassy Island National Historic Site. The history of Canso and the settlement on Grassy Island epitomizes the struggle between Britain and France for control of North America during the 18th century. Finally, on Tuesday, August 2, we said goodbye to Roslyn, Tim, and the guest house, and drove west on Marine Drive back to Halifax, where we visited the Nova Scotia Museum of Natural History and walked through the beautiful Halifax Public Gardens. We returned to Dartmouth for the night, staying at the same hotel as before, and headed to the airport the next morning. In all, I drove more than 1300 miles in Nova Scotia (I did all the driving, although I was spared from having to do even more driving because we hired a limousine to take us between Newark Airport and my mother's house in Oxford, New York). On the flight back to Newark, the plane passed over Digby Neck, and the views below were spectacular. Shortly thereafter, we headed into the murky haze of a hot, humid day back in the U.S. Leaving Nova Scotia was bittersweet, but I am certain to come back to this lovely place, sooner rather than later. The opportunity to visit this confluence, and to be the first successful visitor, was the primary inspiration for my trip to Nova Scotia. I fully achieved my goal, but the trip turned out to be so much more. Thank you, DCP, for inspiring me to go on one of the most memorable and enjoyable trips of my life. In Liscomb Harbour bay, about 530 m from land.